The Mulligan golf trophy was released about a month ago and, by the early response, he’s definitely going to make his mark on the golf world. 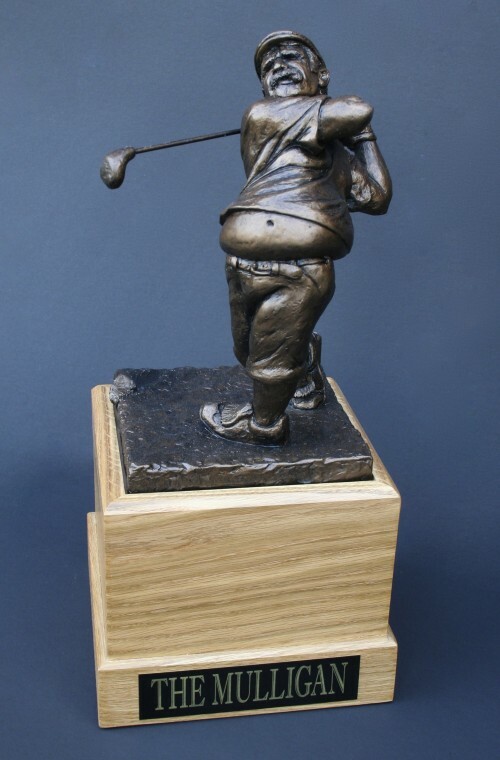 I’ve heard from a bunch of fans of FantasyTrophies.com that the Mulligan is the perfect trophy for their golf tournament, skins game, or to commemorate a hole in one. I knew when I was sculpting the Mulligan that I had something pretty special on my hands. One of the things that I do before I sculpt any trophy is to do some studying of the competition and research other trophies on the market. What I realized was that there is a lot of crap out there when it comes to golf trophies. Go ahead and look for yourself. Google search golf trophy and you’ll be amazed with the amount of junk you’ll discover. I knew I wanted something different and a trophy that would really speak to true golf fanatics and +10 handicappers everywhere. The Mulligan I feel is just that. And by what fans have been telling me, I’m not alone.